The Darwin Chair, designed by graphic design Stefan Sagmeister is 200 chair designs in one chair. 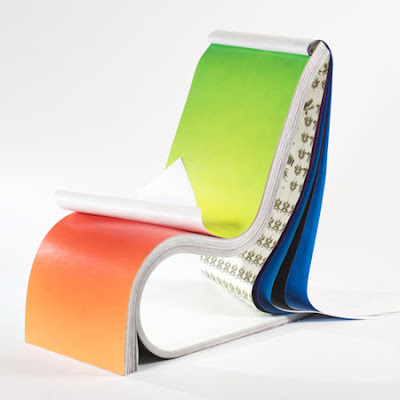 The top of the chair covered with large sheets of paper, each with their own unique design. If you’re tired of one design or it gets dirty, just flip the paper to the next one. 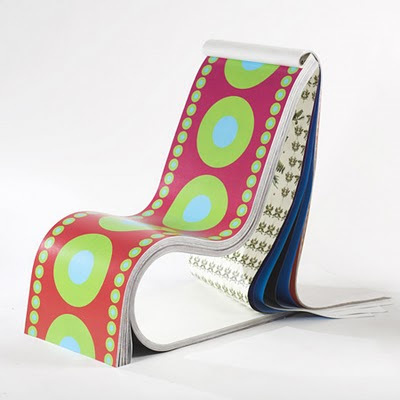 The designer recommends leaving all the papers on the seat and then ripping them off or flipping them over the back to change the pattern on the chair. BUT personally I think it needs to be done the opposite way- starting with all the papers behind the chair because if you spill water or (more likely) beer on this chair, it will soak through all the papers. So I think you’d just want one under you, or a stack of ones you’ve already used. Either way it’s an interesting chair design.